I've never spun polwarth before but I"m excited to try. The fiber seems "sticky", in a good way that it sticks to itself, not in a bad way in that it makes my hands feel bad. It might be hard to draft, but I think that it will spin up in to a great strong yarn. I decided that I would N-ply the yarn, unless I love the way the singles come out. This is a great way of plying without having to plan out how to split the yarn in advance. 2 ply is more fun, but I just have to do a bit more planning. Turns out polwarth drafts like a dream. The fibers are so sticky that it almost wants to draft and spin itself! Cross your fingers that Lucky doesn't get into my spinning now that he's awake. I store the fiber ton top of the wheel and then hope that I can keep him distracted from unraveling my work. This fiber was so sticky (again, the good kind of sticky) that I swear it would ply itself. 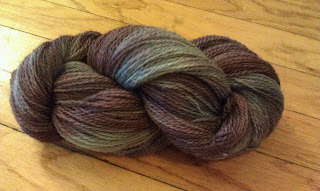 I had NO issues with breaking the entire time and have a spindle full of fluffy 3 ply yarn. (Since I'm a novice, self taught spinner I'm not sure if you would technically call this 3 ply or just N-ply... hopefully I'm not butchering the terminology.) 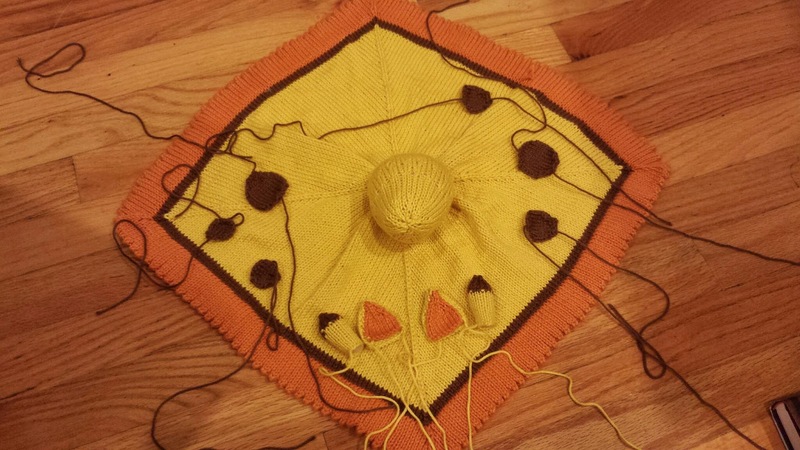 I really like N-plying. I see it like a huge crochet chain that is then twisted together. It always feels very strong to me. 16 wraps over 3" (5-6 WPI, a bulky yarn.) 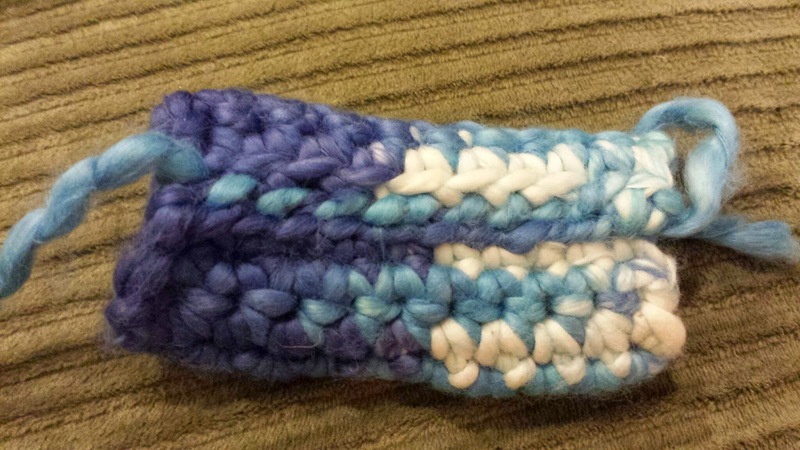 How often have I tried to get a true bulky yarn? 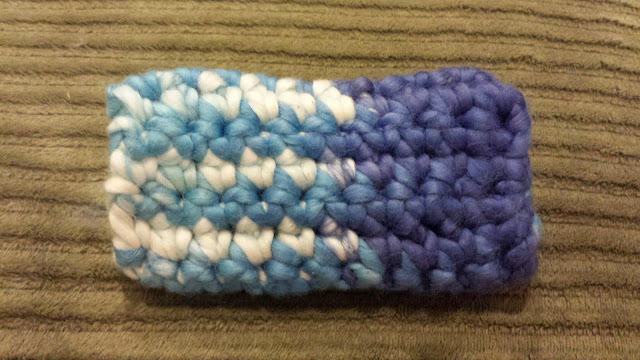 I finally have little enough twist for a very fluffy, bulky yarn. Wahoo! 50 wraps * 4 ft/wrap = 200 feet = 66 yards. 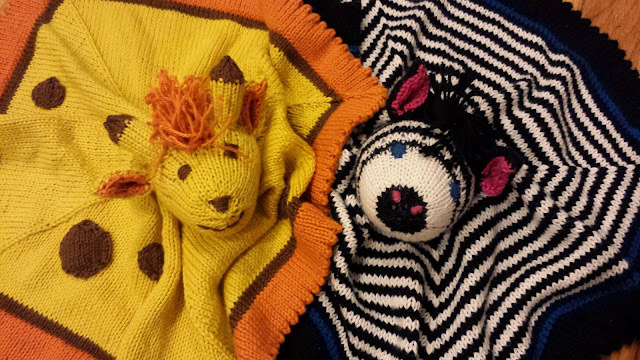 I have made 26 projects (according to Ravelry) using between 30 and 65 yards of yarn. 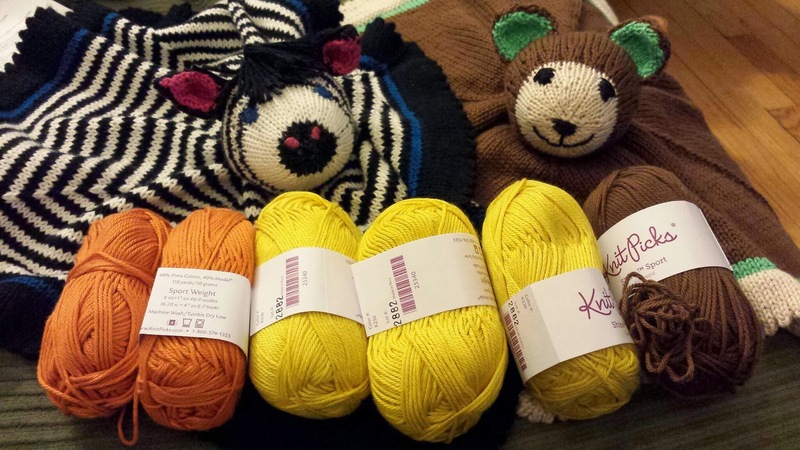 Most of these are baby hats and amigurumi, and are frequently out of much thinner yarn. I wonder what I'll make out of this. I finished the yarn by winding it onto my homemade niddy noddy and set the twist with hot water and let the yarn dry on the niddy noddy. When I went to the fiber fair this summer I saw someone spinning and her singles were SO thin and perfect. I really want to practice spinning up thin yarn again to see what I can do. I've had much more success in not overtwisting my intended-to-be-bulky yarns, maybe I can have the same success with thinner yarns? Wish me luck! Ever since we moved into our new apartment I feel like my yarn stash is out of control. I am really trying to make an effort to use up my remnant scraps of yarn so I have less I'm hanging onto "just in case" I need it. With 16g left of the Chilean cotton yarn I used in the Blue Beary Hat, I decided to make a matching crocheted bow tie. 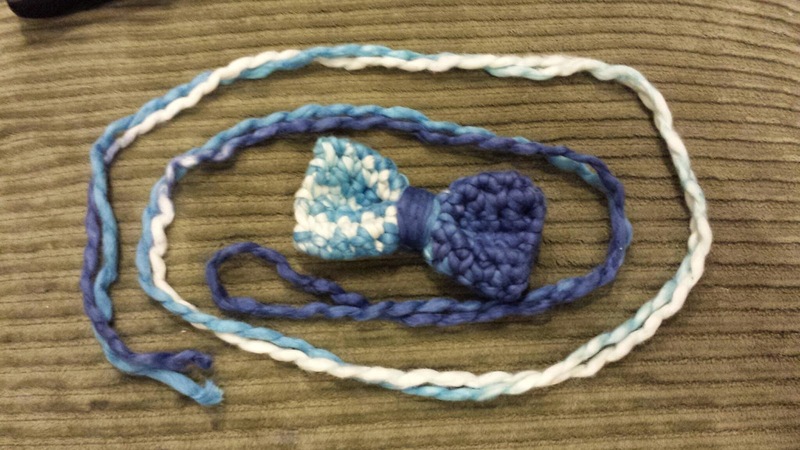 I pulled out my size I crochet hook and prepared to whip up a cute accessory. The pooling is CRAZY cool. I got in the sweet spot of of the repeat to get a regular pattern. 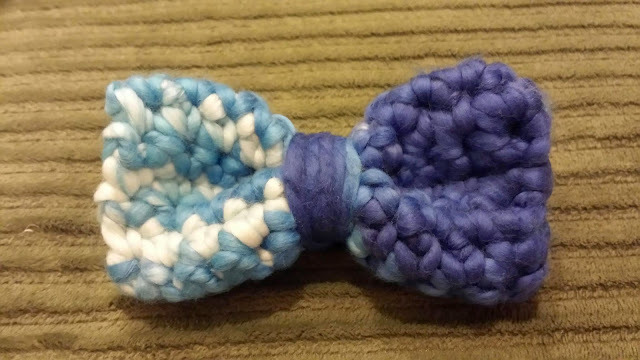 I was a little concerned about how the pooling would turn out using a variegated yarn for the bow tie, but this is just SO cool. I know there are ways to calculate the repeat to get the pooling to happen in awesome ways, but I've never tried it before. I don't think I would have achieved this if I had tried. I followed the pattern as written with one exception, I twisted the bow so the seam could go up the back rather than being on the top or the bottom of the bow tie. With the last two yards of yarn, I held it double and crocheted a chain to be the neck band. But I was only able to chain 25 sts, not 50. It wasn't quite long enough to tie around a neck. So I did a single stranded chain for the neck band. I chained 55 sts on the I hook. It was too thick for me to slide through the band I wrapped around, so I used a needle and sewing thread to secure it to the back. Guys, I DID IT! 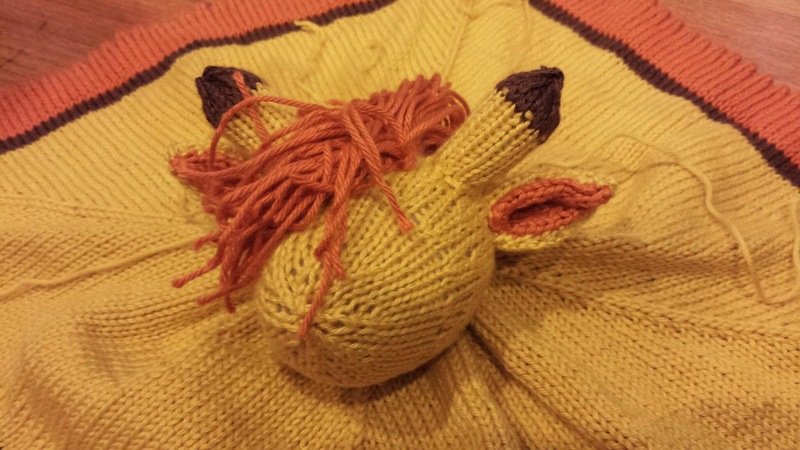 I used 100% of a ball of yarn with NO remnants! 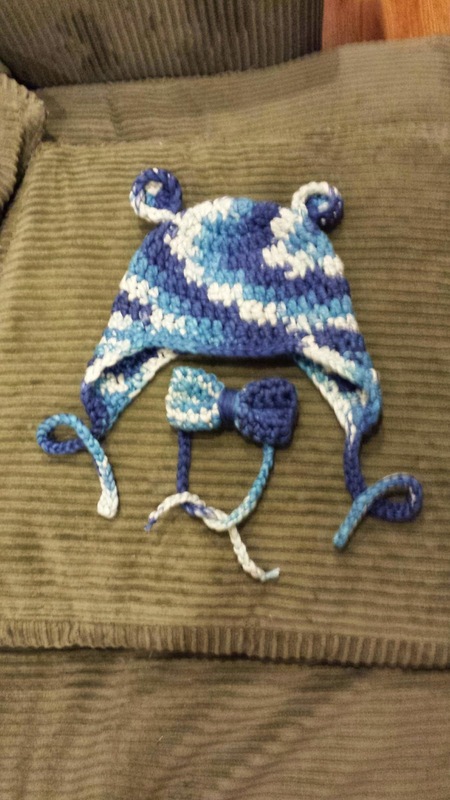 This is something that is completely gone from my stash, and it makes a wonderful baby gift for the newest little guy in my life. I like this bow tie so much that I'm going to need to make one for Lucky. Hopefully I'll love another one as much when I use a different kind of yarn... I couldn't resist trying the to-be-gifted bow tie on Lucky. He didn't love wearing it but oh boy did he look dapper. When my Aunt gave me the book Knitting Yarns: Writers on Knitting edited by Ann Hood for my birthday I didn't know what to expect. I wondered if it was a novel, because it certainly did not look like any knitting book I'd ever seen. It turns out that this brilliant book is a compilation of essays and personal true stories on what knitting has meant in the lives of many famous writers. The back of the book lists many names that I'm familiar with, including Sue Grafton, Barbara Kingsolver and Ann Pachette. I don't want to spoil anything from the stories themselves, but I will share that the book comes with 6 knitting patterns. Since this book is printed on conventional book paper, there are no pictures and correspondingly there are no images to accompany these patterns. 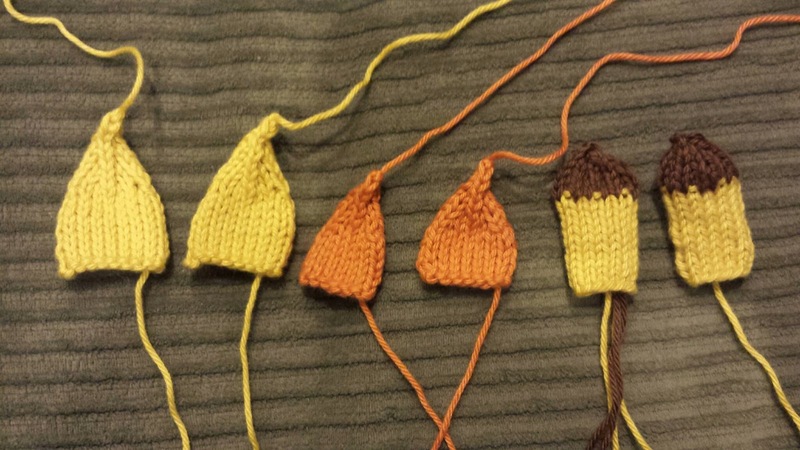 I turned to Ravelry to see if I could get a better peak. (Besides, I realized that I needed to add this book to my pattern library. I love being able to search for patterns that are in books/magazine issues that I already own, but I digress.) The patterns provide a little bit for every knitter: socks, fingerless mitts, coffee cozy, lacy wrap, sweater and a head wrap. 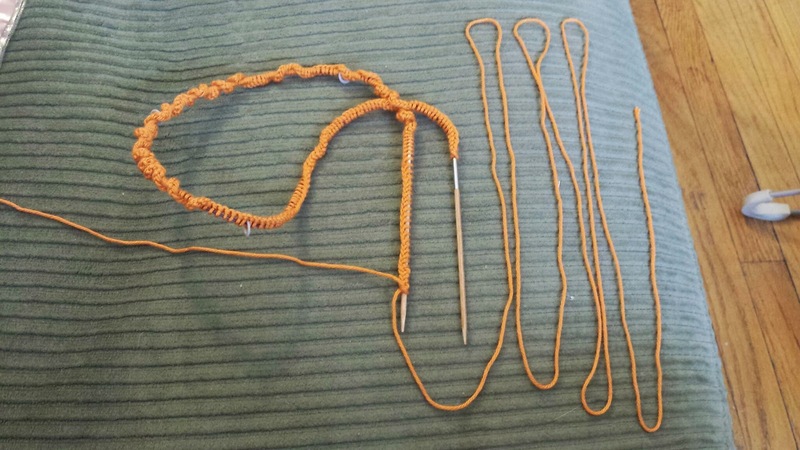 Please keep in mind that these knitting patterns aren't intended to be a learn to knit book. Think of them as the sweet icing on top of the delectable multi-layer cake of this book. I can't wait to keep reading! I've discussed the role knitting has played in my life in interviews and a bit here on ChemKnits, but from reading this book I'm considering working on my own piece. 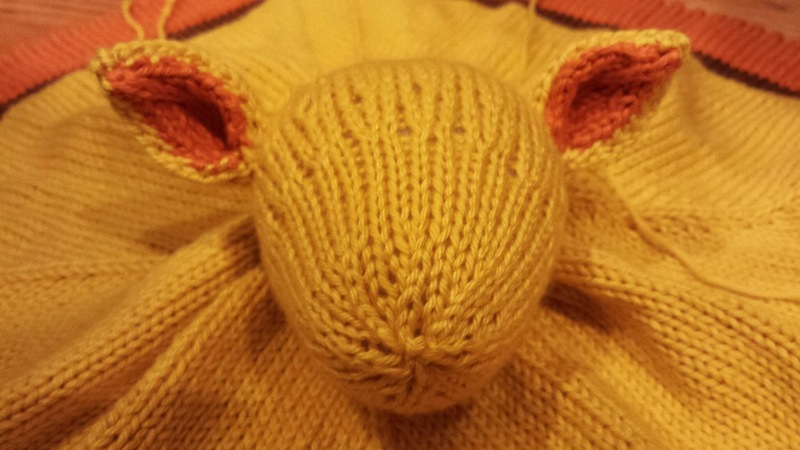 What has knitting meant to you? "Breaking" Dye is when you start with a single color of dye and you see different hues in your final yarn. Food coloring based colors that frequently break are purples and blacks becausee they contain a mixture of blue and red dyes which bind to the yarn at different rates. In the past I've seen some great pictures of yarn dyed with Grape KoolAid that has broken into reds and blues, but when I tried it myself I got a fairly solid color. 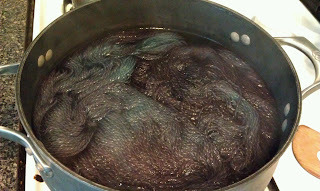 Of course, this first attempt was using a 20% wool blend AND I was adding wet yarn to a dyebath that was heated slowly. My more recent expreience with breaking yarns has come trough adding dry fibers to a hot dyebath so that the reds will strike the parts of the fiber that enter the bath first. I decided to give this a try in my most recent dyeing experiment. I mixed 4 pack of Kool-Aid Grape Unsweetened Soft Drink Mix in 10 cups of water. 100g of KnitPicks Palette bare yarn. 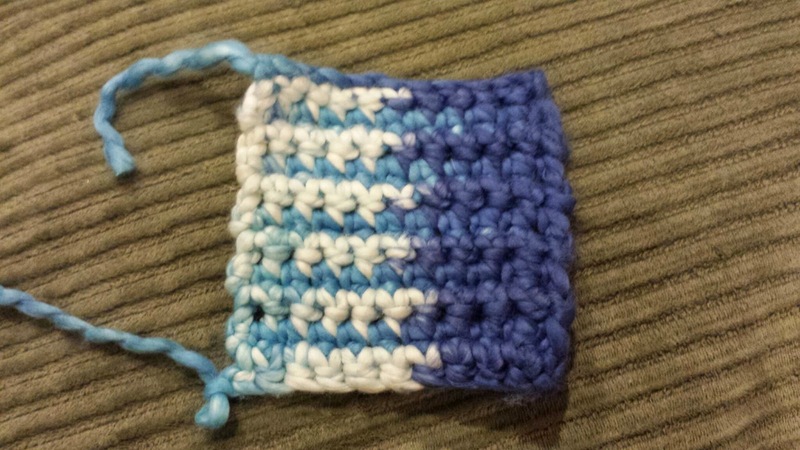 As you will see in the video, the colors started adhering to the yarn almost immediately. I have always been amazed by people who can sew. I am a HUGE Project Runway fan, and what these people can create in the span of a day is incredible. Closer to home, my Aunt M has been given me quilted gifts for years, including an amazing ocean themed quilt for Lucky. My cousin H got a sewing machine a few years ago and she has made herself dresses, bags, wall hangings for her classroom and applique bibs for Lucky. My mom made many of my costumes while growing up, but her first quilting project was a science themed quilt for Lucky, compete with the periodic table and physics equations. I have a lot to live up to... but am I going to break out the needle and thread? I might have some amazing fabric, but I am going to make some No Sew Pillow Covers. I found a wonderful tutorial on How to Make a Pillow with Glue and decided to give it a shot. Gulp. In my standard lab notebook style, I took pictures of each of the steps so I would have something to turn to if I tried this again. 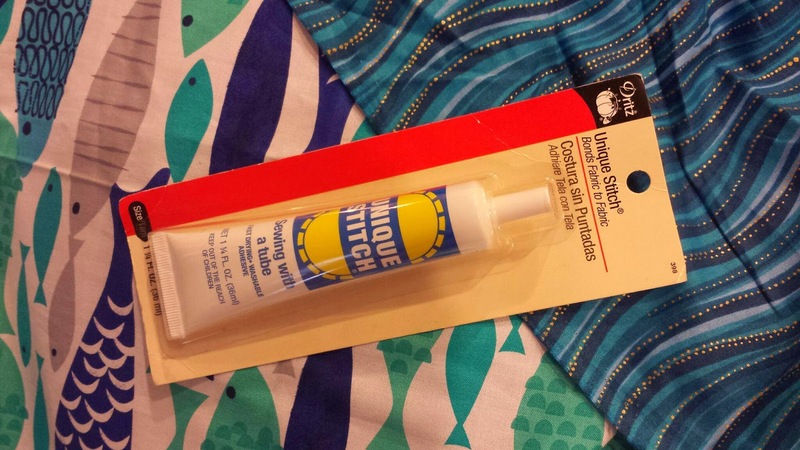 This project requires no sewing thanks to the Dritz Unique Stitch Adhesive . I feel like this is something that I could manage on a sewing machine, but I do not have one available to me and I do not want to stitch these by hand! There are two main goals for this project. 1) Create something for Lucky's nursery with my own two hands and 2) accomplish this without breaking the bank. 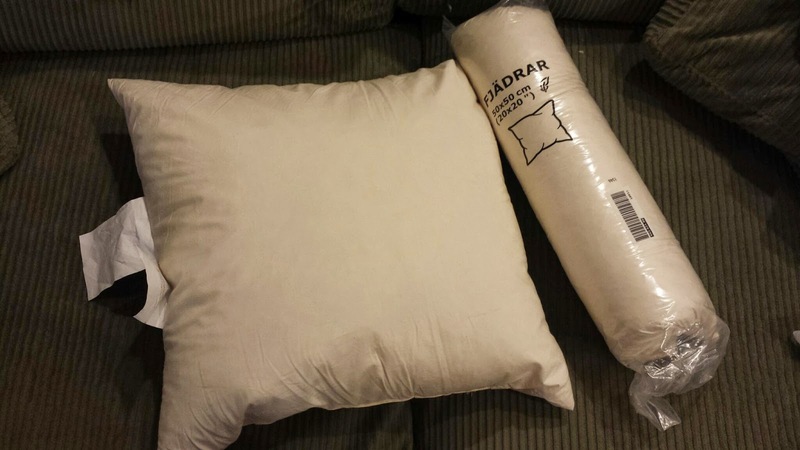 I found some great 20" down pillow inserts from Ikea for $5.99 (as of July 2014). From the comments on the tutorial I see that she used 18" pillow inserts and made the glue 1" from the edge. I think I will make my squares 22"x22" and 22" x 17" (versus the 20x20 and 20x15 in the tutorial) to accommodate for my larger pillow insert size. as I prepared to make my first cuts I was really nervous. Thankfully with fabric 1.5 yards x 44" I knew that I had plenty of space to err. Gulp! The cutting went better than I thought. I used painter's tape to mark my place before starting to cut. After, I folded the first two pieces over the diagonal and it lined up very well. Wahoo! At this point I have two 22x22 inch squares. I have to decide if I want the fish to be the front of two pillows or one. 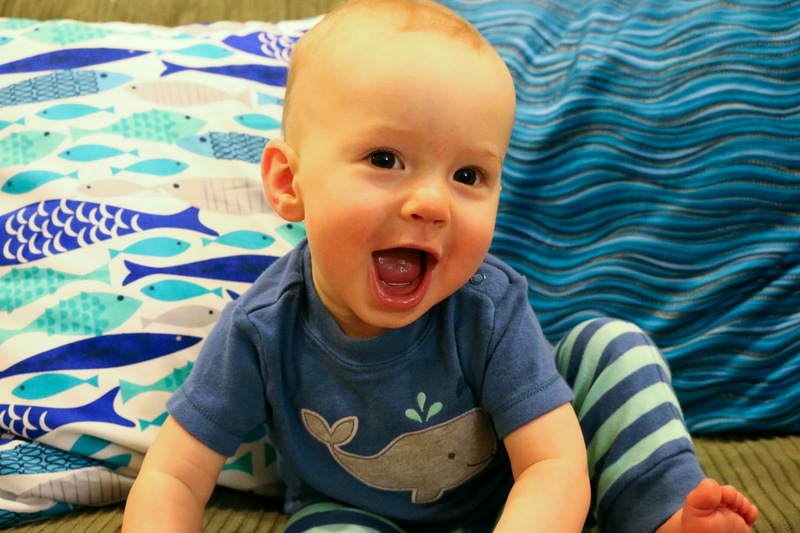 I think I'm going to make three pillows with these two fabrics, 1/2 with the waves on front and 1/2 with the fish on front and waves on back. Which way do you like better? So far I'm thinking I will do 2 with waves on front. I cut 3 of the square pieces and then needed a break. This isn't so hard, and I"m now feeling confident cutting. Crap. I just realized that I don't have enough fabric to do the job. At least not 3 pillows. I can cut 3 front pieces and 5 back pieces, leaving me short on back piece. I really don't know how I miss calculated... maybe I assumed the orientation of the patterns would be different? Either way, I would recommend having 2 yards for 3 pillows. 1.5 yards is enough for 1 pillow with space for a cutting error. On day 2, I "hemmed" the edges with the glue. I didn't quite make 1" hems, which maybe means that I could have cheated with 16 or even 15" wide pieces for the back. I DID make sure at the last minute to hem them in a way such that the fish would be looking in the same direction on the back of the pillow. It would have bugged me forever if I had fish swimming upside down! I thought cutting was the hardest part of this pillow project... but the hardest part was waiting for the glue to dry so I could stuff the pillows with the inserts! I turned the cases right side out, and carefully slipped the insert into one pocket before flipping the other over. Voila! Two awesome pillow covers. Now I just need to wait for the fabric to arrive so I can complete the third matching pillow for this set. I'm also waiting for the chair-and-a-half to arrive that these pillows will live on, but that is a whole other story. My happy boy is really loving his room! Woobies for my besties! 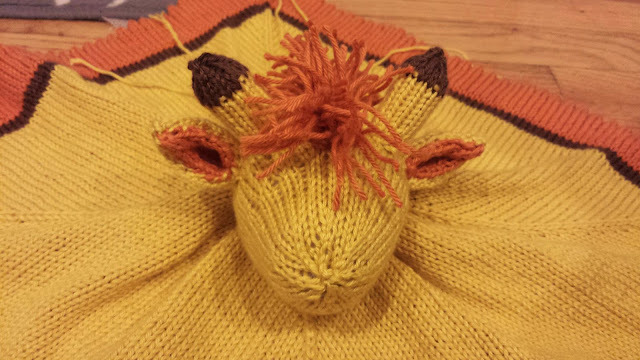 As soon as I created the woobie bear for Baby G I needed to cast on for Samoline's baby giraffe. Why so soon? The baby isn't due for another 7 months! Well I wanted to let part of all of the woobies cuddle together, they are pals after all! 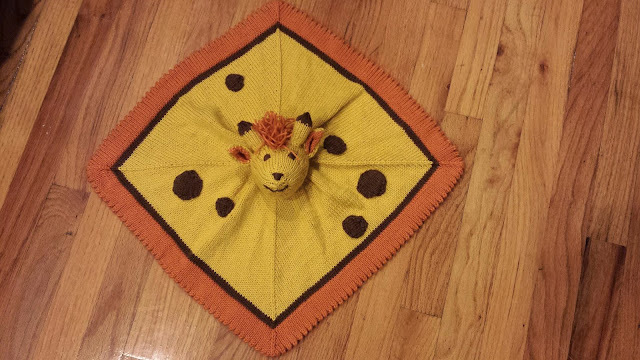 Mama-to-be Caroline loves giraffes, and as soon as I saw this woobie pattern I had it earmarked for her future child. 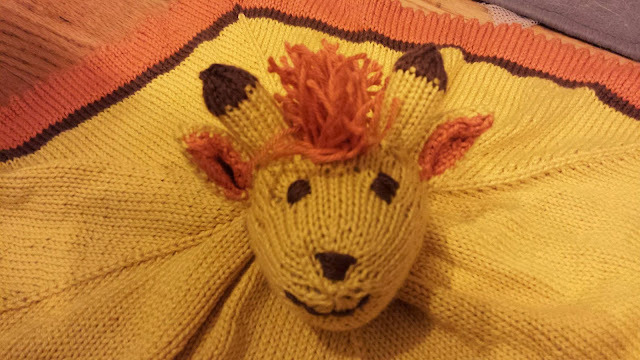 I used shine sport in Clementine (Orange), Mongoose (Brown) and Dandelion (Yellow). I would have liked a paler yellow but there wasn't an option for that. 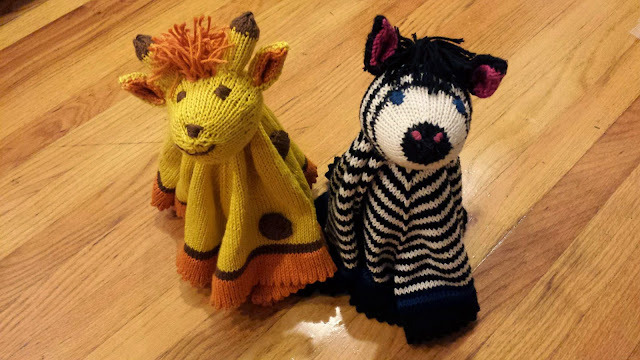 This little boy will LOVE his brightly colored giraffe, so I'm not worried. 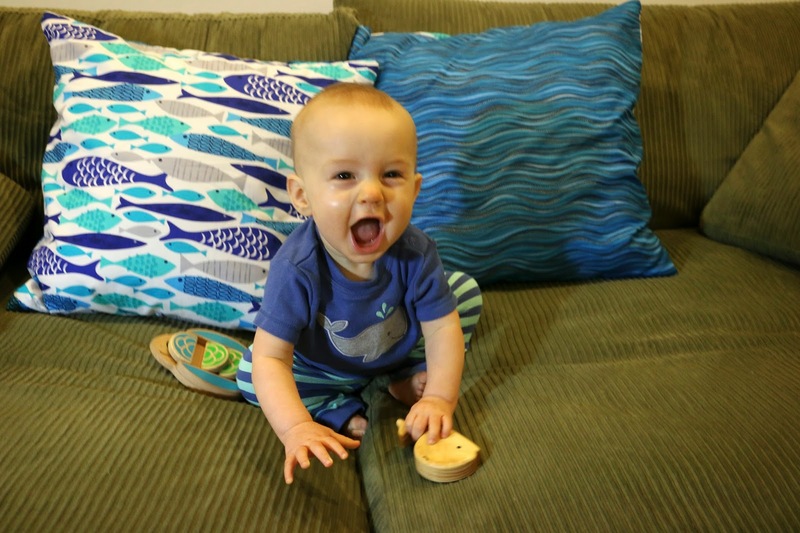 (And I think his mama will be pretty thrilled, too!) Like the previous woobies, I used size 3 needles to complete the project. Can I please cast on enough stitches in one go this time? Clementine ball 1 weighs 35 g. I tried to OVER estimate the long tail I'd need. If I did too much it is okay because of the orange fringe on top in the end. 4th time's the charm, right? 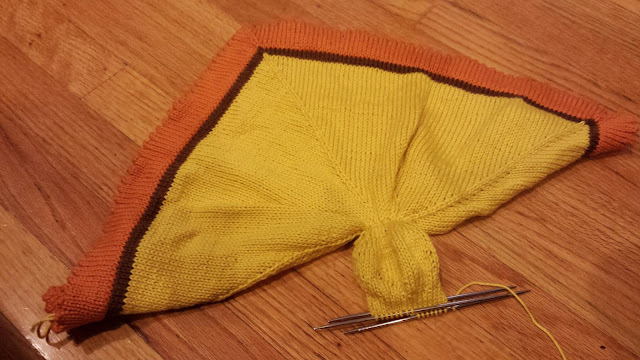 I did not knit one round before starting the increases since I used a long-tail cast-on rather than provisional. Clementine ball 1 finished at the end of round 11. Ball 2 weighs 49 g.
I do my decreases a little differently from the way they're written for Rnd 13 (more like the instruction for Round 1 of main blanket.) 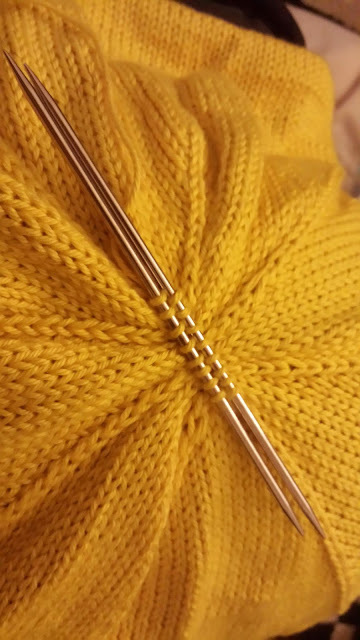 On a decrease round, I slip the first stitch and then knit until 2 stitches before the marker where I make a cdd. The slipped stitch becomes part of the last cdd of the round. I realized that I don't think I've ever written this down, and given that this is my 4th woobie you would think that I'd have mentioned it before! 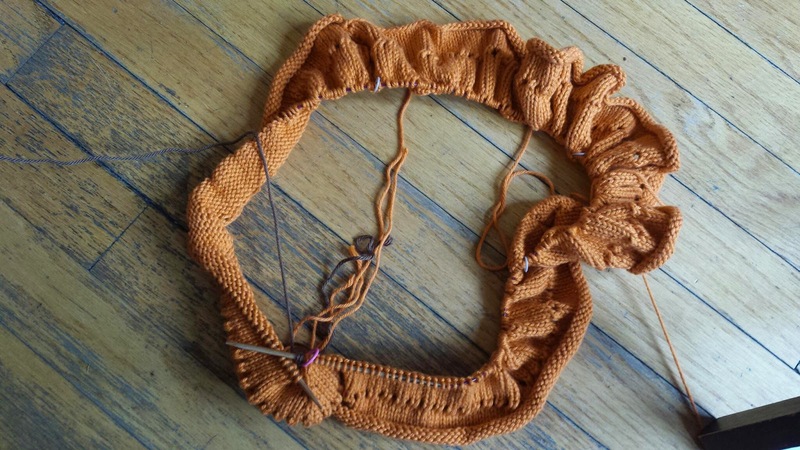 Row 25, switched to Dandelion (49 g) to work on the body. In crochet club I lost track of whether I was on an odd or even for a few times in the rows that followed, but I was always able to make things work in the end. Hurrah for catching mistakes before it was too late! Yellow Ball 2 (49 g) joined half way through round 48. I knew from the bear that round 63 is where the extra decreases should start. After row 55 I have 41 sts between each marker so I am right on target. I love it when I'm on target! After row 62 I have 35 sts between each marker and am ready to begin the additional decreases. I love how I had to put this project down multiple times and I was able to get my stitch count correct, but the first two times I made a woobie with FEWER distractions (i.e. no baby Lucky) I messed up. 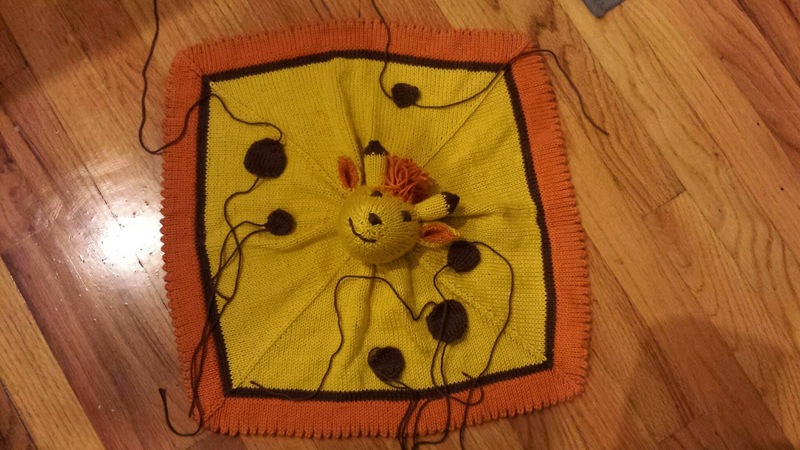 I made mistakes along the way on this giraffe, but I caught them in time so I was able to go back and fix them. I guess being aware that I was going to make mistakes was helpful after all. I am having so much more trouble on this woobie! I think that having a baby has really altered my focus. Thankfully I've been catching my silly mistakes, as I want this to be perfect for baby Samoline! 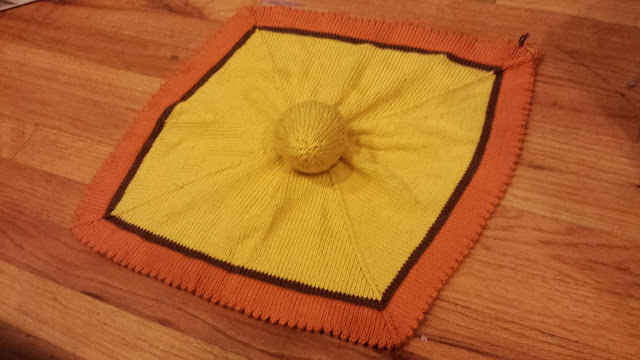 I moved into a new apartment in June, and this project was the only knitting project I had accessible. (NO DISTRACTIONS! MUST FINISH BEFORE BABY GETS HERE!!) 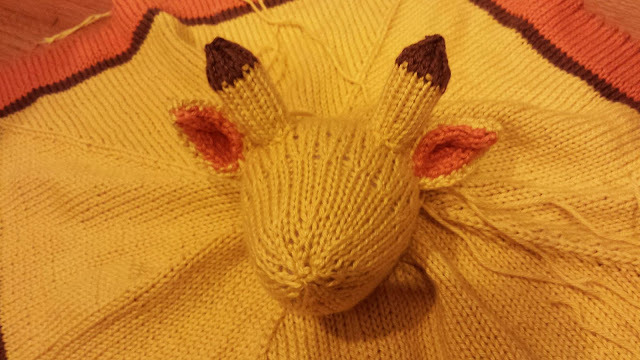 As I was nearing the top of the head at the end of July, I realized *gasp*, I don't know where my fiberfill is! Thankfully I had it listed on the packing inventory so I knew what box to look in. This is the first of the woobies I've created to have some spots on the blankie portion itself. 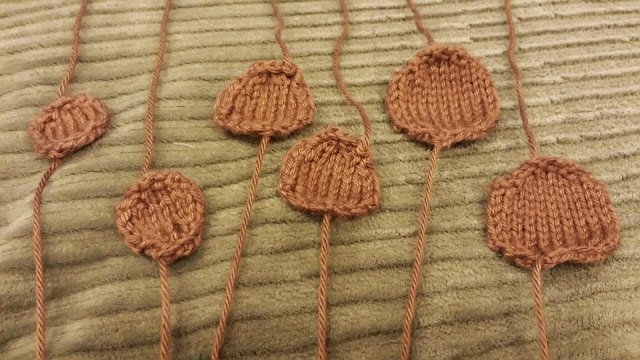 They were a cinch to knit but unfortunately my stitching will show up on the wrong side of the fabric. I have a feeling this little boy won't mind, though. 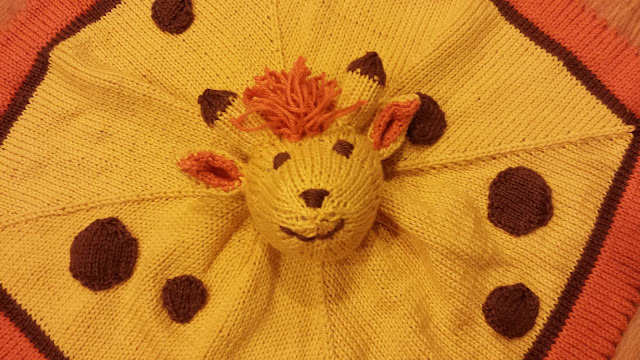 I considered crocheting the spots, but in the end decided to just follow the pattern as written. I was nervous when it came time to stitch the ears onto the giraffe head. I wish that there were some step by step photos to help with the placement. I folded the ears in half and stitched them to the sides of the head. Then I took the inner side and secured that down so they would be less floppy. My sassy little giraffe needed a hair cut. I finished this project 1 day shy of 6 months since casting on. It used Orange 67 g, Mongoose 17 g, and Dandelion 98 g.
Thankfully there are some photos of the spot placement on the Ravelry page to use as reference. 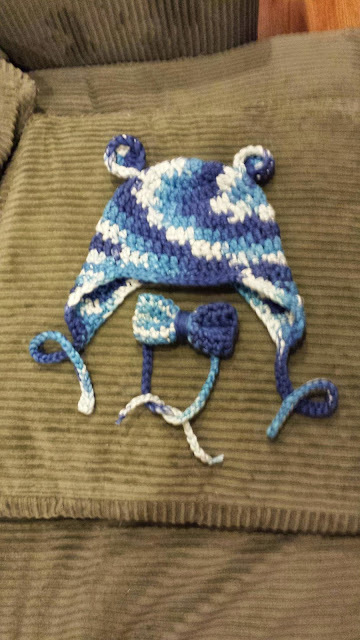 I am SO GLAD that I finished this project before the little guy comes into the world. I love you, Caroline and Sam!